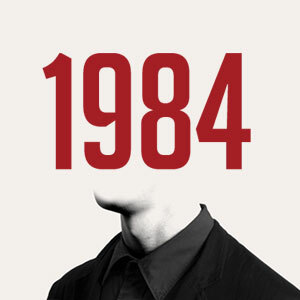 In the accompanying text to Headlong’s adaptation of 1984, they state that ‘Robert Icke and Duncan Macmillan […] explore how Orwell’s novel is as applicable to the here and now as it ever was’ whilst the online trailer (below) draws on quotes from Bradley Manning and The Telegraph to make a clear link between the book and the current debate over surveillance culture. In light of this the most surprising, and indeed pleasing, thing about Headlong’s production is how little it explicitly aligns itself with a modern world environment. Whilst Icke and MacMillan have played with form and function to add to a richer audience experience than would be allowed from a book that channels itself through the perspective of just one character, it is set within a world that far more closely resembles that imagined by Orwell than our current technology driven present. This comes as a relief, as the idea of merging Orwell with modern society seems wholly too obvious and more than a little trite for a company who have carved out a reputation for purposefully innovative takes on heavyweight texts. Orwell’s book may have something to say about the dangers of allowing any one party to exert control over society but to try and parallel this with the use of modern surveillance techniques in democracies is facile and only serves to undermine the potency of his argument. Indeed if the examples that Runciman highlights in his review of The Snowdon Files is an accurate picture then it may be possible for governments to gather information on pretty much anyone but the idea that they have any sort of competence to use it to manage history and through it control society comes across as laughable. The reality is that our general contempt for politicians is so great that the only way that they could get us to believe that 2 + 2 = 5 is to insist upon us that 2 + 2 = 4. The entire existence of the internet – and with it websites like Wikileaks – serves to undermine the notion that Orwell’s book could become reality in a society as it currently exists. The world is too globally networked to allow a political organisation to control the flow of information in the way that Orwell envisioned; even in countries that use firewalls it is still relatively easy to get around censored sites. Big Brother may well be watching us but that does not mean that Big Brother is controlling us. So it comes as a relief to discover that the computer on which Winston toils away to reshape history is an item that seems strangely out-of-kilter within Chloe Lamford’s set design, which evokes that late-Communist feel of a country industrially advanced but only holding its infrastructure together with threads. The communal canteen at the Ministry could be from any 1970’s public sector building whilst the grainy feel of the video through which we watch Winston and Julia’s secret trysts, and the voyeuristic overtones it brings with it, inevitably recalls The Conversation and the paranoia that runs through Alan J.Pakula’s The Parallax View and Klute. That we may be reminded of the likes of Warren Beatty and Jane Fonda brings home a deliberate and brutal reality about the lives of Winston and Julia; that ordinary people, the archetypal Party drones, are rather bland and uninteresting, that desires and thoughts are mostly mundane and not the unique, world-changing inspiration that we like to believe. They may yearn for change but they will make do with chocolate and real coffee. As we rail isolated against the system and plot great change from within who would want to admit to being more like Winston, with his ill-fitting vest tops and sweaty lank hair nervily considering whether or not to write a diary, rather than Beatty’s journalist, immaculately coiffured and square-jawed, uncovering conspiracies that go all the way to the top. All of this is brilliantly exposed by O’Brien (Tim Dutton) who shows Winston the sad truth about his grand love affair; its furtive and grubby nature feeding a narrative that saw their radicalism only leading as far as their own desires. O’Brien levels the charge of solipsism at Winston, and the real terror of Headlong’s production is the struggle to disagree with the accusation. Their love, so important and all-consuming moments before, now seems so small; the world may have moved for them but they did not move the world even an inch. Even Winston’s morality is questioned in a scene that makes explicit what is given only a few lines in Orwell’s book. Winston, and the audience, is reminded of his gleeful affirmations of what he would do for the resistance; O’Brien shows footage of Winston saying he would be willing to throw sulphuric acid into a child’s face. O’Brien in his calm and reasonable way, whilst holding Winston at the Ministry of Love, is asking us to consider whether this is really someone we should be ceding the moral high ground to. Tim Dutton has got O’Brien absolutely spot-on; his is a fatherly presence capable of bestowing terror upon Winston whilst at the same time making it appear like the fairest thing to do and entirely in Winston’s own interests to do so. The rational manner in which he explains the logic of the Party as he casually orders various tortures to be applied is chilling and the frustration he displays at Winston’s arguments resembles more a teacher despairing at a talented yet errant pupil. As a result what we see is a far more complex character than a simple cog in the Party machine; O’Brien, as Winston will, truly loves Big Brother. Problems with this production rest primarily on the difficulty of adapting it to the stage. 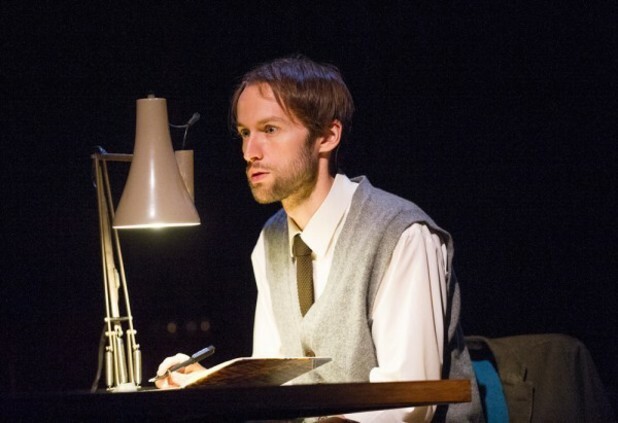 Orwell’s Winston Smith is an everyman who comes alive in his inner thoughts and whilst this persona may work on the page it leads to an occasionally dramatically inert character on stage. Mark Arends does what he can and is impressive when the action moves to the Ministry of Love but earlier scenes leave him with little to do other than advance the story. The same criticism applies to the part of Julia (Hara Yannas) who rarely seems more than a convenient plot-point on Winston’s journey. It is a shame because there is something interesting in the hints that Yannas’ Julia gives of experience in negotiating various affairs before Winston. Her decision to be fatally drawn into Winston’s belief about changing the world is sadly not explored in any great detail. However you go to Headlong for innovative direction and the visual spectacular, and what initially seems like a fairly unpromising flat fronted, narrow space falls away to reveal hidden depths. To say more would constitute a spoiler but it is sufficient to note that Headlong cleverly make you realise how easy it is to not just control what someone is seeing but also their understanding of what they are seeing when you have absolute power over the conditions. The transition is remarkable and the play moves into an entirely new register that is significantly stronger than what came before. There are wonderfully ideas dotted throughout and the sense of a society that has taught itself to ignore the dissonance between ‘truth’ and ‘reality’ is embedded in scenes that appear to be on a loop except for slight variations that only Winston can see. The result is the most subtlety powerful moment of the production as Parsons continually repeats a story to Syme until the day that Syme is no longer there. On this occasion Parson pauses for a moment, less than a half-beat, before continuing to talk to the empty air as if nothing was amiss. The automatic self-editing of objective reality is as terrifying an image of the Party’s success as anything conjured up in the two-minute hate. As it toured the country the play was greeted with five star reviews from both regional press and from Guardian and The Telegraph. Appropriately the reality felt somewhat different. It is an enjoyable and innovative piece of theatre that builds to a gripping finale. However the first 20 minutes feel a little disjointed and the decision to move between present and future, using Orwell’s appendix as a base, seems to be a framing device that is never fully integrated into the production. 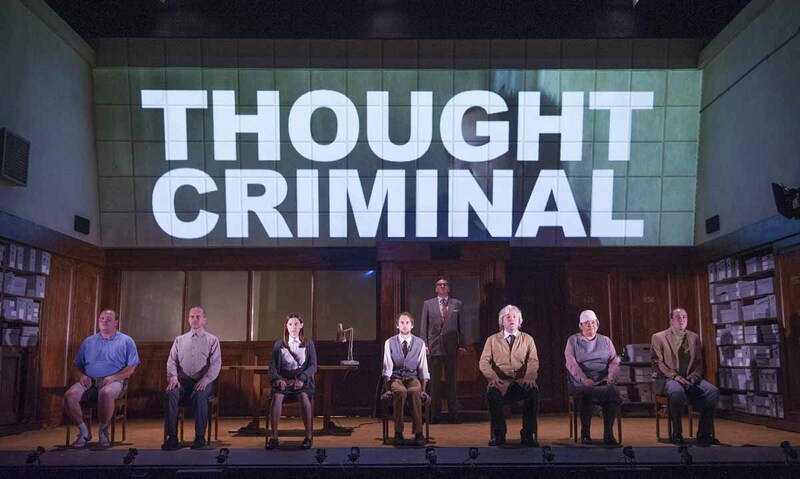 There is also a more fundamental question of the rationale for adapting 1984 for the stage. That so much exists within Winston’s interior world is one issue but more problematically the core of what makes the book so fresh – the use of language, hugely imaginative ideas like doublethink and unspeak – is something that was clearly felt to be untranslatable to stage and so has been almost completely stripped out. Dramatic inertia can be worked around but to take so much away from the language is to give 1984 a retouching that even the Party might have been proud of. This is quite a dumb review given that they include basically all of Syme’s speech about newspeak and doublethink. Did you sleep through that bit?